Scandinavian-based slot developer NetEnt has made a habit of getting online slots players excited ahead of a new release and after the success of releases in 2013 including the dark and eerie Creature from the Black Lagoon slot and the hilarious South Park slot, it is no surprise that this slot has got slots fans thrilled in 2014. 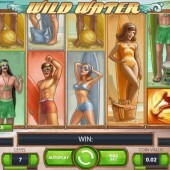 Wild Water is a 5-reel, 20-payline slot that has a distinctive Point Break feel, with a Beach Boys soundtrack that is going to get Brian Wilson inspired to reach for his pad and pen to start writing some new material. I know what you're thinking, we should be so lucky! Looks like we're stuck with the CSI soundtrack until that day comes! Hey Dude! It's the Symbols! The symbols on the reels comprise of a range of surfers from the 1970s and for slots fans that grew up in this era it really will be a nostalgic trip back to those summer holidays with your friends after school finished. There is the cool jock surfer in red trunks, the hippy surfer dude in green trunks, the obscenely cool afro haired surfer in yellow trunks and the hot beach babes. Bodacious, the Shark is Wild! The Wild symbol on this slot is represented by the shark. This Wild substitutes for all other symbols across the reels to complete winning combinations, except for the Scatters. The cool thing about this Wild is that it also acts as an Expanding Wild on the reels giving you more chances to complete winning combinations. There is a free spins bonus round on this slot that is triggered when you hit three or more of the surfer Scatters across the reels. It is possible for you to earn up to a tasty 30 free spins if you trigger this bonus feature. Cowabunga! Win 20x Your Line Bet with the Surf's Up Bonus! There are two other bonus features that are up for grabs on Wild Water. The first is the Surf’s Up Bonus. This is when you hit three or more of the same surfer as an expanding symbol across the reels. If this happens then you will win 20x your line bet. It isn’t mind blowing for a prize but it does add a bit of excitement to every spin. The second bonus feature is the Surf Team Bonus. This is if all five reels are filled with a different surfer so that you essentially have five different surfers filling the five reels to complete your surf team. If you manage to do this then you will be awarded a staggering 200x your line bet prize. 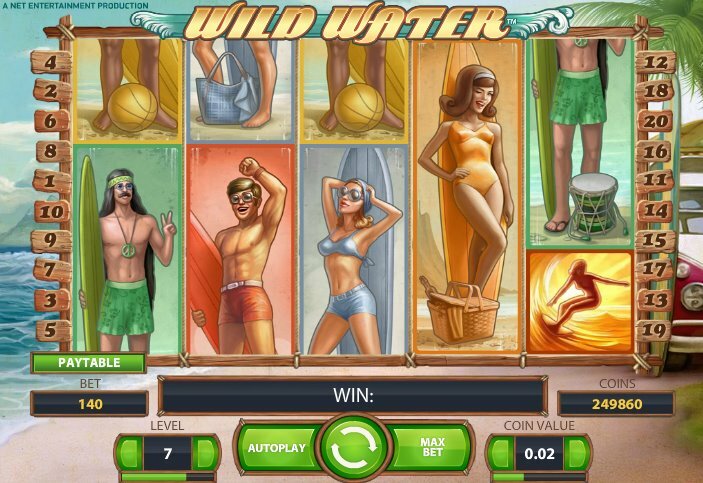 Wild Water is a groovy new release by NetEnt and, personally, I preferred it to the previous slots releases from the Wild series such as the explosive Wild Rockets slot and the riveting Wild Turkey slot. The Surf’s Up Bonus and Surf Team Bonus add a little something extra to proceedings but it would have been better if they had included a more interactive bonus. It feels a bit shallow because the bonus features lack depth. Still, it did give me some fun for a few hours and I’m sure it will earn an army of fans over time.